He was certainly not born with a silver spoon in his mouth. Henry Porter Baldwin was born in Rhode Island in 1814 and was orphaned when we has 12 years old. To support himself he began working as a clerk in a store, learning how to be a merchant. He moved to Michigan in 1838 and built up a shoe business, which he later sold to Hazen Pingree, whose statue is in Grand Circus Park facing toward St. John’s. By the time he was 40 he became involved in politics and was present at the first convention of the Republican Party in Jackson, Michigan in 1854. He served in the Michigan Senate from 1861 to 1862, he was elected to two terms as Governor of Michigan, from 1868 to 1872, and he later served as a U.S. Senator from 1879 to 1881. His later business interests included banking. 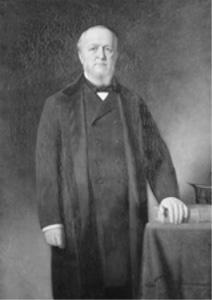 He served as the director of the Michigan State Bank and president of the Second National Bank of Detroit, 1863–1887. He also served as a trustee to various charities and educational institutions. At his death he bequeathed money to over a dozen charities in the City of Detroit. We give thanks on this Founders’ Day for Henry Porter Baldwin, for all those in the beginning, he was the primary founder of our parish. It was he who was the donor of the land, the one who acquired the plans for chapel, church, and rectory, and donor of a substantial amount of cash toward their completion. He also was the one who called the meetings to organize the parish (see that story on page 4). What we have here today at St. John’s, as far as buildings and land, are primarily the gift and motivation of Henry Porter Baldwin. All done in great faith and hope. By God’s grace we continue in that same faith, and continue with great hope. St. John’s has gone through good and bad times in her history, and has never wavered on the proclamation of the Gospel. Truth never ages.